The story of The Monkees has become so ingrained in the history of rock & roll that it needs little repetition. The short of it: A band formed for a television sitcom rebels against its svengali to become a real unit, along the way making some of the most enduring pop music of the 1960s. Good Times! is a bit of an unusual record in that the songwriters that the project has attracted have gained marquee status alongside surviving Monkees Micky Dolenz, Michael Nesmith and Peter Tork. It makes sense in context: Although Nesmith and Tork are talented songwriters, many of the band’s most enduring hits were written by others. For Good Times!, the band enlisted the help of several top names in indie rock and power pop. The album also features finished versions of recordings that were left incomplete during the group’s 1960s heydey. Although it would seem like this mixture of old and new recordings would make for an inconsistent affair, it totally works on record. The album begins with its title track, a solid blues rock duet between frontman Micky Dolenz and late singer/songwriter Harry Nilsson. Hearing Nilsson on this song, and especially how central he is to the recording, is arguably more of a shock than hearing Davy Jones’ voice a few songs later. Yet, 2016 Dolenz and 1968 Nilsson duet believably and solidly. The remainder of the songs that were based on 1960s recordings are all quite good, although the age of the backing tracks are more noticeable on some songs over others. 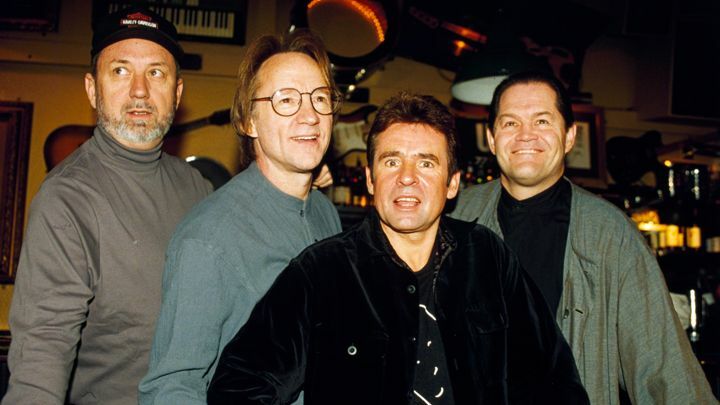 “Love to Love” is the best of this lot and the one that will likely get the most attention because the late Davy Jones is its credited lead vocalist. The song also has the highest quality audio of any track using archival records, showing the care that was given to this particular song. “Love to Love” is a great send-off to Jones in that it’s the kind of tune to he did best: a jangly, uptempo guitar pop song with a fun, memorable chorus. If this is to be to the Monkees what “Free as a Bird” was to the Beatles, it comes off considerably less forced. As for the songs that are headlined as much by their all-star songwriters as they are by the group, there’s a lot to love there too. Each songwriter giving their own distinct interpretation and spin to the group’s sound. The songs never once feel like they were somethings their writers happened to have laying and gave away to this project. Each feels like they were explicitly written with the Monkees in mind, and often a particular member specifically. A highlight is Ben Gibbard’s terrific folk ballad “Me & Magdalina”. The song is lovingly interpreted by Michael Nesmith, with tremendous harmonies from Dolenz. The excellent lyrics from Gibbard describing a desert road trip between lovers, are sweet and wistful. The power pop tune “Whatever’s Right” is another winner with a strong melody. It was written by Monkees songbook vets Tommy Boyce and Bobby Hart in 1966, but never recorded by the group. The band gives the song a new lease on life in the recording present here. “You Bring the Summer” is a particular treat, both as a neat summer pop tune and as a rare songwriting credit for XTC frontman Andy Partridge. Fans of XTC will be quick to notice that all of the little vocal cadences and quirks that are present in most of his compositions are here. The album’s first single, “She Makes Me Laugh”, is one of the best songs that Weezer singer Rivers Cuomo has written in a decade. The lyrics are knowingly dorky, but ooze so much charm. The song feels specifically crafted for Dolenz’ voice and it’s his best performance on the album. Less of a success is “The Birth of an Accidental Hipster”, a psychedelic song co-written by Oasis’ Noel Gallagher and The Jam’s Paul Weller. It feels like Weller and Gallagher were the only writers that went out of their way to make a pastiche of The Monkees’ classic songs as opposed to making something fresh. They don’t even succeed at that; The song tries for a segmented approach and the parts don’t together well. To wit, it’s an Oasis tune with a refrain straight out of the Jam’s playbook stuck in the middle. On the whole, Good Times! is a rousing success and the band’s best record since the Head soundtrack from 1968. The production work by Fountains of Wayne bassist Adam Schlesinger is warm and inviting. and its to his credit that the newly recorded songs mesh so well with vintage recordings. The rest of Fountains of Wayne appear throughout the album and feel right at home as the ad-hoc backing group for the Monkees. All three of the surviving Monkees sound great on the album and never once seem like they’re phoning their performances in. The presence of Mike Nesmith throughout is a particular delight. He’s been relatively wary of participating in Monkees reunions, but he’s on the top of his game here and leaves you wondering why he doesn’t record or perform as often as he should. Micky Dolenz sings lead on most of the album’s track and his voices seems to have not aged a day since the late 1960s. Peter Tork is a little less present than one would expect, but his two spotlight tunes are very solid. Good Times! 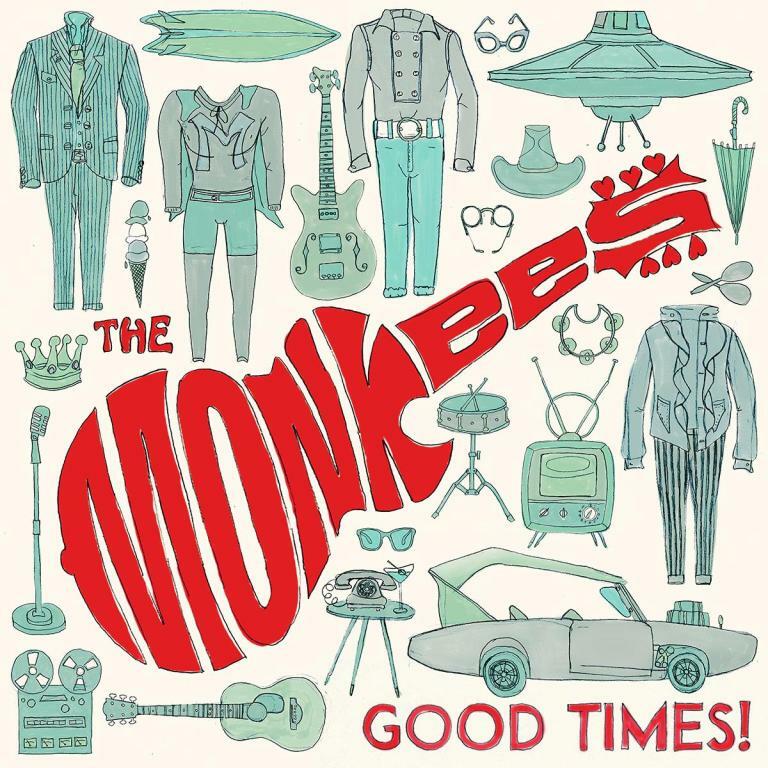 is an wonderful trip through the history of the Monkees and proof that the band is still capable of producing a solid, relevant album fifty years after their formation. If this the last album the band ever releases, it will stand as a happy ending to their long story.